I’ve been waiting for a swing low to mark the daily cycle bottom and likely the intermediate cycle low also. As long as we close positive today we will have that swing. (We will also have a four day rule possible trend change) I think there’s a very high probability that Thursday marked the bottom. The thing is they also always eventually bottom. 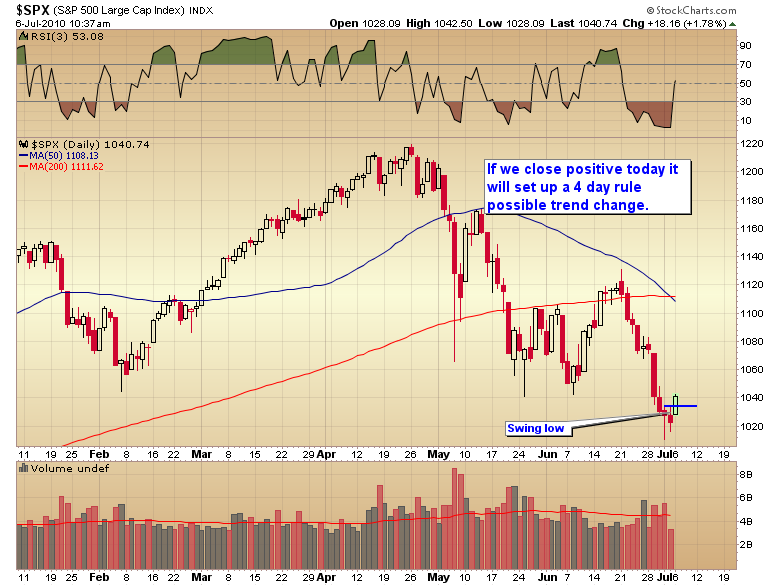 Then the market rallies long enough to reverse sentiment back to bullish extremes. In bull markets that means new highs. In bear markets the fundamentals pull the market back down before new highs can be made. Once I become convinced we have indeed put in the intermediate cycle low (a pretty good tell is when the bears start blaming the rally on the PPT. A sure sign they got caught short at the bottom) then the bounce out of that low will tell us whether we are back in a bear market, or whether this has just been a correction in a cyclical bull. If the market rolls over and moves below the intermediate low (which appears to be at 1014 if the swing holds) then yes the markets are back in bear mode. If we go back up and make new highs…well that would be obvious now wouldn’t it? So the next month or two should tell us the true direction of the market. This entry was posted in Uncategorized on July 6, 2010 by Gary. You have to be a fool not to know where this market is headed. Gold to 1000 and the dow will slowly grind lower. Sure a little pop for a couple of days but will be heavily sold into. Welcome to the world of deflation. The question is why isn’t gold rallying then? Does anyone else get the feeling that the G-man is about to school the traders again? The world of deflation currently features a sharp dollar plunge. BTW silver is rallying 🙂 The dollar can’t continue to collaspe much longer without gold responding. A crumbling dollar has been the driver of every C-wave finale. You know it will be different this time G-mon. Hope AGQ works out for all of us. Well I must say I thought we’d seen a short term bottom also. But this is one nasty intraday reversal and it seems that we may need to probe even lower to get that intermediate cycle low. Anybody still denying that the bear is back is really deluding themselves here. And they’re going to bleed themselves dry trying to buy the dips. Shoot, we crashing again. Got tricked into buying! Are you kidding? With everything we’ve been over you still want to buy the stock market? gold down too, now what? Still a bull market. Buying opportunity. Even secular trends are subject to counter-trend moves. Today’s action seems does not seem capitulatory, and it certainly does not seem like anticipatory accumulation. To have the PMs underperform the broad market on a day the dollar gaps down is reason for concern, imo. Certainly there will be counter trend moves but that’s why they are buying opportunities because they are counter trend and at some point the secular trend returns. You seem to have a pressing need to avoid a draw down at any cost even if it means you miss the buying opportunity. I just don’t suffer from that affliction. Well, I am scared. Prechter says Dow 1000 soon. Does anyone know whether silver has bottomed? Give me a break the Dow is over 9000. In what dooms day scenario do we lose 90% of the value of the stock market anytime soon? We didn’t even do that in the Great Depression. Sheesh is common sense completely gone from society nowdays. In your view, at what point does a self-defeating fear of drawdowns switch to the prudent exercise or risk management? Well I’ll stick with gold and it’s bull market support, as even if Dow 1000 materializes, with a 1:1 Dow:gold ratio, gold’s max downside would be $1000, even though I think that is highly unlikely. Depends on if you are a trader or an investor. An investor rides the bull till the fundamentals change. It also depends on your goals. If you just want to try and eke out a little profit then use stops and trade. If you want to get rich off a secular bull then you have to be willing to do what’s neccessary to make the big bucks. That means holding on to positions during corrections and in fact seeing the correction for what it is, an opportunity to accumulate at cheaper prices. You have to think like a value investor though, and realize you aren’t going to time the exact bottom but you are buying on sale, even if it’s not the exact bottom of the sale. Like I said these intermediate cycle bottoms always make everyone think they will go on forever, but they never do and that includes gold. 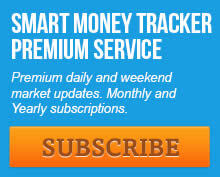 Listen buddy your on the smart money tracker here! Risk management is for pussies! Why don’t you put on a dress and head on over to The Big Piture if your unsure. This here blog ain’t for pansies. Gary, do you like value stocks more or pm more? There won’t be any such thing as value stocks until we get to true secular bear market lows. That means trailing P/E’s under 10 and dividends above 5. So I have to go with the bull market and stick with the PM sector until we get to that point where stocks are trully cheap and gold is trully expensive. You got a time machine? Do you know that silver had virtually no upside the last 5 years? From $7 to over $19 is virtually no upside? After it hit 15, it has gone nowhere for 5 years. Stocks have went nowhere but lower for 10 years. Do you also have a monkey? At the top of the 06 C-wave silver hit $15. At the top of the 08 C-wave it hit $21 dollars. A 40% increase even if someone managed to buy the exact top of the 06 C-wave. Now we are just waiting for this C-wave to run it’s course. Even at todays price silver has still gained almost 20%. Compared to the stock market since 06 that damn good. I’m not sure how you get that silver has done nothing in five years. Maybe you studied a different kind of math than I did. I’m going to take a guess and say we never see $3 silver again and we never see $850 gold again just like we’ve never sen $200 gold even though gold entered a 20 year bull market. Stocks have gone everywhere in the last 10 years: First lower, then higher, then lower, then higher, then lower, and here we are. S&P is lower now than in July ’00, which I guess is Anonn 1:10’s point. Not exactly an earth-shattering observation. It usually takes a while to get to strong hand status 🙂 and one almost always has to suffer through at least one hefty drawdown. But vacation sounds good to me. I’m about ready to head to the Sierra’s for the summer. I’ll check in again this fall on my portfolio. Any comment on the $200 million negative SPY money flow today? I wish people would stop wasting everyone’s time by bringing up Prechter. If you like him so much go to his site and don’t come here! Maybe it means the market still has further to go and this swing will be a fakeout. By anon @1:51’s logic,he should say silver has gone everywhere in the last 5 years. Time to get in and ride this market just a weeee bit longer. At dow:gold ratio 1:1, gold has 20% downside and 250% upside from here. Long GOLD is the trade! John Hussman likes PMs, but believes there will be short term pain in the sector before the longer term trend possibly resumes. Near term is certainly cloudy. On one hand gold may (and probably is) working it’s way into an intermediate cycle low. On the other hand the daily cycle is becoming very stretched and the dollar is collapsing. A collapsing dollar has driven every C-wave for the last 9 years. I certainly wouldn’t buy front month options by any means but then again I certainly wouldn’t panic out of the sector especially if it means locking in losses. Just hang on and the bull will eventually correct any timing mistake. China not buying much gold. Small buys. This is not good for longs. Just working it’s way into an intermediate cycle low just like it did in Feb.
Once the low is in the second stage of the C-wave should be underway into the high demand fall period. This is week 22 and the average is 19-20 weeks so the cycle is already running long and could end at any time. Something is wrong. Gold crashing again. Just checking in after the holiday, and not too surprised or too happy that gold is lower even if I expected more downside after the recent action. That said, today offers me up the best case scenario to ADD to DGP (still up 17% thanks to Gary), and start buying the miners (NG, GDXJ, and maybe SVM) I’ve been patiently waiting for. Down open in gold can be bought today. Since most think we’re headed into, or already in the Greatest Depression and I agree, I’d suggest taking a peek at Homestake Mining and Doming Mining AFTER the 1929 stock decline. I don’t expect miners will again get anywhere near the lows of late ’08, just as they didn’t revisit lows after 1929. Getting long miners today, then going on a long vacation only to check in once per day at most, probably even less.